Create a WordPress Child Theme and Customize Anything. The best way to customize WordPress themes. Create a child theme quickly and easily. Coordinate all aspects of your WordPress site. Keep your existing widgets, menus, templates and other settings. Search, preview and modify ALL of the styles in your theme. Stay current without losing your changes. A child theme is a special feature of WordPress that lets you override specific styles and functions of another theme. By using a child theme, you can update any WordPress theme without losing your changes. Child Theme Configurator makes it easy. Child Theme Configurator is a fast and easy to use CSS editor that allows you to create Child Themes and customize them beyond the options of the WordPress theme Customizer. It helps you easily identify and override the exact CSS attributes you want to change and gives you unlimited control over the look and feel while leaving your WordPress Theme untouched. Child Theme Configurator parses and indexes a WordPress theme’s stylesheet so that every media query, selector, attribute rule and value are at your fingertips. Second, it shows you how each change you make will look before you commit it to the Child Theme. Finally, it saves your work so that you can fine-tune your WordPress Child Theme without the risk of losing your edits. You can make any number of Child Themes from any existing WordPress Theme. 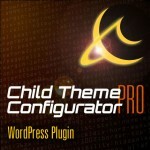 Child Theme Configurator lets you choose from your installed WordPress themes (even existing child themes) and save the results in your Themes directory. When you are ready, just activate the child theme and your WordPress theme takes on the new look and feel automatically.